Edited by Giovanni C.F. Villa. Text by Jhumpa Lahiri, Elisabetta Rasy, Giorgio Montefoschi, Nicola Gardini, Roberto Alajmo. Antonello da Messina is one of the earliest virtuosos of oil painting, a true Renaissance master who—via the influence of the Flemish painters—raised perspective and geometric rigor to new heights of clarity and serenity. His mastery of the three-quarter profile portrait is another of his key accomplishments. With 300 color plates, and at 340 pages, this book is the most comprehensive monograph available in English, and the first substantial Antonello publication in decades. 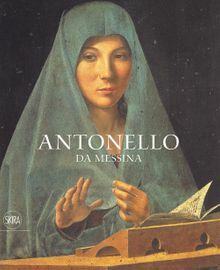 Today Antonello is most celebrated for paintings such as his Crucifixion in Bucharest and the Salvator Mundi, Madonna with Child and Saint Jerome in His Study in London. These works, alongside his portraits, embody his accomplishments in realism and the steady, calm atmosphere he brought to Italian painting.This exceptional publication fills a longstanding and conspicuous gap in the literature on Italian Renaissance art. 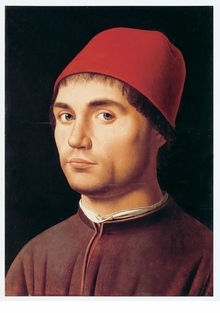 Antonello da Messina (c. 1430–79) was one of the most groundbreaking and influential painters of the Quattrocento. Born in Sicily and trained in Naples where he studied the work of Provençal and Flemish artists, he is often supposed to have encountered the pioneering art of Van Eyck at this time, whose influence he seems to have imported into Italy. Antonello's impact was particularly keenly felt in Venice, where he lived from 1475 to 1476; within a short time of his arrival, his work attracted so much favorable attention that he was supported by the Venetian state and local painters enthusiastically adopted his oil technique and compositional style. Hardcover, 9.5 x 12 in. / 336 pgs / 300 color.